FAQ: Is there a bladder for RV black and gray water storage? Question regarding a bladder to hold gray and black water: I would like to obtain a bladder type of tank to hold gray water from an RV. The approximate size would be about 50 - 60 gallons in the space of 3' x 3' and 1' height. At this point in time, I do not know what type of connectors I need and would like to see a listing and pictures of all the various connectors you can place on such a bladder. Answer: Hello! We would be happy to work with you on your project! 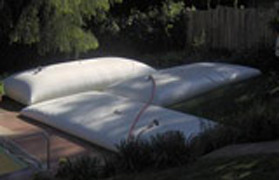 Given the low profile of your storage space, the bladder tank (also known as a pillow tank) is an excellent choice for this type of gray water storage. Profiles on these tanks will typically be fairly low in size, allowing them to fit in tight, height-restricted locations. The Gray Water Bladder Tanks are available in several different sizes that can easily be adapted to fit your storage requirements. Sizes can easily range anywhere from 25 gallons to 210,000 gallons in capacity, including a 50 gallon and 60 gallon sizing option. In terms of some sizing options, the gray water bladder can typically have a size of around 36" in width, 52" in length and only 9" in height. We can make custom sizes for the bladder tanks so we would be more than happy to see if this option is something that could work for your location. 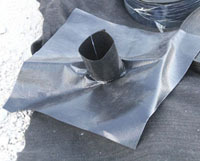 Fitting options for a bladder to hold gray and black water can vary depending on your application and requirements. Standard fittings range from 3/4" to 2" in size with large fittings of 4" through 6" available upon request. Fittings are typically made from the aluminum, stainless steel and polypropylene materials with camlock, storz or threaded options to fit hoses. Additional fitting options can include ball valves, pressure relief vents and caps. If you need help selecting the right fittings for your project, we're happy to assist.